Damage Options Notes Build a couple of these if your playstyle leans toward dealing damage. Titan's Bane can be exchanged with any other penetration item if you're mostly targeting squishy enemies. You'd get Bloodforge in an ability build due to its large power and passives. The health shield/movement speed after a kill will allow you to re-engage or retreat (thanks Draisaitl). The added lifesteal is a plus. Defensive Options Notes Build a few of these on Bruiser Builds. Helps you survive and initiate fights with your ultimate. Hybrid Options Notes These contain a bit of protections and a bit of power. Consider over true defense items if you want to lean more towards damage. Purchasing in the middle of your build will keep your mid game strong, while giving you protections against enemies who haven't quite built up their damage. Magi's Cloak: Almost free Purification Beads (Doesn't protect against slows and cripples). Midgardian Mail: This is so OP right now. If any basic attackers are giving you trouble, build this. Pestilence: Enemy has lifesteal or any type of healing? No one else on your team buying it? You can buy it, and it fits nicely into a bruiser build. Hide of the Nemean Lion: Great anti crit item. The damage reflected is BEFORE mitigations, so stacking protections is beneficial. The exception to this is Spectral Armor. Building these together gives slight diminishing returns on the reflected damage. Winged Blade: Got an annoying Ares building Gem of Isolation, Midgardian Mail, and consistently using Shackles on you? Build this. It fits pretty well into most bruiser builds due to the high health, movement speed, and CCR. Relics Notes Purification Beads, Aegis Amulet, and Blink Rune are my favorites. Purification Beads will usually be required. Late Game Consumables Notes Definitely pick up Elixir of Power if you have the gold. If you're earning gold like crazy, stack Potion of Physical Might on top of that. Pick up the red damage buff while you're at it. Brutalize with Seething Howl and a fully stacked Heartseeker in a damage build. GG. You may not have enough game time for Elixir of Power. In that case, try to make the most of Potion of Physical Might. If you get Elixir of Speed in Clash, you'll have to decide what to replace boots for, depending on how the game is going. If the late game is going well, I would prioritize Elixir of Power. Power, Penetration, Cooldown Reduction, Dual Protections, Health, and Utility (Movement speed). You can consider buying Ancile earlier if you're diving the enemy a lot and magical threats are a problem. Masamune third is OK as well. The passive feels stronger in the earlier stages of the game. If you find yourself being heavily focused, Mantle of Discord or Spirit Robe are good options to consider. Draisaitl's Bruiser Build Notes Get another damage option instead of Spirit Robe if magical enemies and crowd control are irrelevant. Example Build vs. Mostly Magic Notes Don't use Void Shield if physical threats are irrelevant (unless your team mate(s) can take significant advantage of the aura). Heavy magical compositions will usually have a lot of CC. Consider items like Ancile, Spirit Robe, Magi's Cloak, etc. in your build. Example Hydra's Lament Build Notes Target squishies. Don't forget to auto attack cancel (discussed in the combos section). Example Damage Build Notes If you want more damage, get Hybrid options like Shifter's Shield or Masamune instead of Magi's Cloak (best bought in the middle of your build). If you don't mind being extra squishy, get another pure damage option instead of Magi's Cloak. If you want more defense, get something like Mantle of Discord instead of Magi's Cloak. You can delay buying defense if your team is pushing well and you're good at position/picking off enemies out of position. This way, your mid game damage will not suffer. If enemies are building defense, I'd get Titan's Bane (6th item slot) instead of Heartseeker. His chains shut down your Unchained + Brutalize and easily prevent your escape. He can force you to burn your beads or your Ragnarok with his No Escape. Purification Beads is a must. Magi's Cloak helps against No Escape but will NOT save you from Shackles. You may consider Winged Blade for this guy. Her Entangling Vines is an AoE cripple. She'll easily be able to peel off your Brutalize to save an ally, while blocking you from using Unchained to escape. You're an ability based god. Her AoE silences are your bane (you can't ult out of her silences). Try your best to dodge her Shadow Lock. Purification Beads is a must. Magi's Cloak helps as well. This dude's Whirlpools are bad news for you. It shuts down Unchained and Brutalize from a distance and sets you up to be Kraken food. Magi's Cloak will NOT help against Whirlpool. You can ult out as a last resort. His Vanish makes it tough to Brutalize him. His recent nerf hit him pretty hard, but he's still strong enough to 100-0 a squishy late game. Mantle of Discord's passive is nice here to deny him a kill. The taunt can lock you down and set you up to be killed. Other guardians with good initiates (they can easily dive into the action) and hard CC fall under this threat level. Purification Beads and Magi's Cloak help. Of course she has a leap, so she can escape your Brutalize. Her Gravity Surge hard counters any gods with a leap. You have 2 leaps in your kit. Magi's Cloak can help you out here. He's a Late Game hyper carry. In Arena, he WILL get to Late Game. For Arena, all hyper carries fall under this threat level at Late Game. Your support should be building items like Witchblade (or have a damn good reason why he isn't building it). Build tankier than usual if you need to. Aim for 40% CDR (be an ult spamming, team player to make sure your team wins). Make sure to counter build. Look into Midgardian Mail mid-late game. Pay attention to when his Purification Beads and ultimate are down. Stun him with full runed Unchained and bring him back to your team with Ragnarok. If his ultimate is up, do NOT fight him. His regurgitated minions will get in your way while his cone AoEs shred you. Purification Beads and leap out with Unchained immediately. Hide of the Nemean Lion may not help as much since that's mostly an anti crit item. A good Bakasura's damage comes from Butcher Blades and Qin's Sais passive. Because Myst told me to. Fields Of Love can quickly peel you off from a kill and turn the tables on you. If he's building cooldown from Transcendence and Jotunn's Wrath, this will be an issue. First 2 items - Ex 1 Notes Jotunn's Wrath makes your early game strong, but you should sell it late game. This may delay your final build and make it harder to buy that Elixir of Power. This option allows for flexibility, in case you no longer want to commit to a basic attack build. First 2 items - Ex 2 Notes Weaker early game compared to Jotunn's Wrath due to lack of CDR, ability based penetration, and mana. However, you don't have to sell any items to complete your build. For more information, see "Basic Attack Builds" under Summary of Builds and Gameplay Stages. First 2 items - Ex 3 Notes Another potential example if you don't want to buy Jotunn's Wrath. You'll still have some mana problems. The lack of CDR may also be an issue. Penetration Notes The Executioner is core in these builds. Stone Cutting Sword's and The Executioner's passives stack with each other! DPS Option 1 Notes If you decide to build crits, get at least two crit items. DPS Option 2 Notes If you aren't building crits, you'll need Qin's Sais in your build to maintain a high DPS. Qin's Sais offers more flexibility since you don't have to expend 2 slots like you do for crits. Defense/Hybrid Options Notes Ideally, pick one item from this list if you are going to build defense. MISC Options Notes Frostbound Hammer or Hastened Katana are good crutches if you are having trouble sticking to enemies. PICK ONE. Frostbound Hammer's 15% attack speed slow is a way to reduce a hunter's DPS. The movement speed slow also offers control for team fights. Hastened Katana attack speed is great for boosting damage with Qin's Sais. If you bought Stone Cutting Sword, you can sell Warrior Tabi late game for Hastened Katana. However, delaying your final build may not give you enough time with Elixir of Power. Bloodforge can be used to boost your Seething Howl in a boxing match. The passive will also be useful after defeating an enemy - you can engage again or retreat. Asi can pair nicely with Qin's Sais. Significant lifesteal if you fall below 35% health and use Seething Howl. The Crusher's attack speed has functionality for a basic attack build. The +15 flat penetration has functionality for your abilities. Relics Notes Purification Beads is a must. Blink Rune is good for initiation/escape/kill secure/setup with Ragnarok. Aegis Amulet is also a viable option since you'll be seeing a lot of focus with a basic attack build. Late Game Notes Elixir of Power is very good right now. If there isn't enough time left in the game (Arena), then just try to make the most of Potion of Physical Might. Inspired by Draisaitl's Build (Crusher 2nd Item) Notes Get a pure defensive item instead of Shifter's Shield if you want to sacrifice some power for more defense. If you're have trouble sticking to enemies, you can consider selling Warrior Tabi for Hastened Katana late game. Remember, delaying the final build may not give you enough time for Elixir of Power. 30% CDR for ability spamming. Fair amount of physical/magical protections. High attack speed for Qin's Sais passive. Example Crit Build (Jotunn Sold Late Game For DeathBringer) Notes Masamune 3rd because I like the movement speed. Remember, enemies aren't fully built yet, so the protections/health are more useful here. Rage 4th so you can comfortably stack (don't build any later than 5th). Stone Cutting Sword 5th because i like the added movement speed. Get The Executioner before Deathbringer if enemies are more tanky. Otherwise, get The Executioner last. Frostbound builds (Jotunn Sold Late Game For DeathBringer) Notes Rage 4th for comfortable stacking. Frostbound Hammer afterwards lets you stick while you crit. The added health compliments Mantle of Discord's protections. After you build Jotunn's Wrath, your next item choices are somewhat flexible. Build them when you want/need them. If you're being pressured, get Mantle of Discord earlier. If you're good at picking off enemies that are out of position, and your team is pushing well, get it later. Prioritize The Executioner before Deathbringer if enemies are tanky. Otherwise, get The Executioner last. If you don't want crits, get Stone Cutting Sword 4th and Qin's Sais as your 7th item. Relics Notes Almost everyone on the enemy team will buy Meditation Cloak first. Early game, play as an aggressive ult spamming bruiser. Tower dive with Blink Rune and bring back enemies for your team with Ragnarok. However, you may consider Purification Beads first if there's an Ares. Example Build: Stone of Gaia sold late game Notes If magical threats are relevant, build Pestilence. If another ally is building it, build Bulwark of Hope, or Oni Hunter's Garb. Build Jotunn's Wrath sooner if you want to prioritize CDR. Otherwise, focus on Brawler's Beat Stick to deny enemy healing ASAP (especially if another ally can't build it). Build Void Shield earlier if magical threats aren't a problem and anti healing has been taken care of by another ally. Start option 1 Notes +5 more power than the Round Shield start. Multi Potion and Healing Potion in case you need simultaneous healing from both potions for a very early engagement. Start option 2 Notes This start is for Void Shield 2nd item. Branmuffin17 and I like this start. Core (situational) Notes Get Void Shield 2nd item. If you get Jotunn's Wrath 2nd item, get Void Shield 3rd. If you need to build tankier for the situation, don't buy Jotunn's Wrath. Some options for last two items Notes Brawler's Beat Stick: Need to get this earlier if enemy healing is an issue. Otherwise, it's a luxury damage item with good power and penetration. Masamune: Building this in the later stages of Conquest because that's when enemies start grouping up for team fights. Spirit Robe/ Mantle of Discord/ Magi's Cloak: Pick one if you're getting focused a lot. Oni Hunter's Garb: Good for extreme magical situations. Titan's Bane: If you need to punch through tanky enemy compositions. Midgardian Mail: If you're having trouble vs attack speed based gods. No jungle build is set in stone. Pick your items according to the situation. You may need more than 2 items from this list. Relics and Late Game Consumables Notes Blink Rune first for aggression. Purification Beads 2nd for survival. If you get Elixir of Speed, you'll have to decide what to replace boots with, depending on how the game is going. Example Build (Round Shield Start) Notes Switch order of Jotunn's Wrath and Brawler's Beat Stick if enemy healing is relevant. Void Shield as 2nd item helps when I gank a physical ally's lane: The ally can follow up more effectively. Remember, enemies have less physical protections early game. Last few item slots are situational. Example Build (Mace Start) Notes Last few item slots are situational. This guide covers Fenrir mechanics along with builds/strategies. The discussions are generalized, but the items and gameplay chapters are most helpful for Arena, Clash, and Siege. However, I do have a build for Conquest, but all related discussions are isolated in the purchase order notes. Everyone's play style is different. This guide is simply just a suggestion of items and strategies for you to tinker with, not a concrete list of rules and regulations. It's very hard to miss, but at the top of this guide, you will find this button (circled in dark blue). 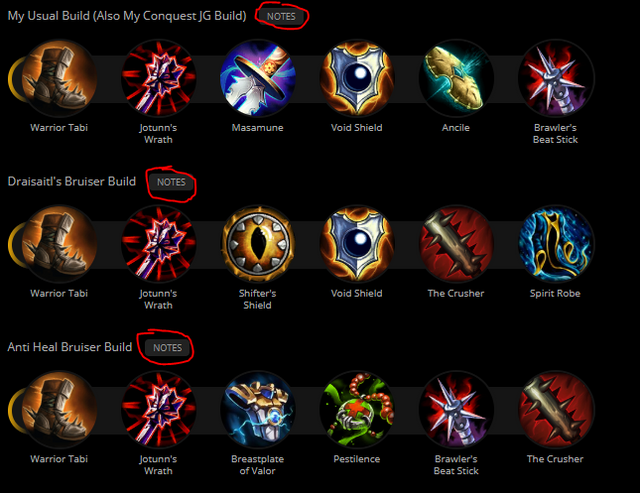 If you click on it, you can view all my different builds (circled in red). ADC: Attack Damage Carry. A late game god whose basic attacks hit hard and fast. Usually hunters. Basic Attack: Most people refer to this as Auto Attack. Auto Attack Cancelling: See "C-C-C-COMBOS Chapter." Bruiser: A god that can dish out fair damage while building tanky. Ideally how you would build Fenrir. CC: Crowd Control - stun/root/cripple/disarm/etc. Every hit from a Basic Attack activates 1 Rune, up to a max. of 5. Unchained, Brutalize, and Ragnarok gain additional benefits when used at maximum Runes and the Runes are consumed. Enemy gods that Fenrir kills will fully activate all of his Runes. Assisting with a kill will grant Fenrir 3 Runes. Stack 5 of these by basic attacking ANYTHING (minions, enemy gods, Cabrakan's Tectonic Shift, Medusa's Petrify statues, towers, phoenixes, etc). To assist with a kill, you don't have to do anything. Just be near the enemy when your ally kills him. If you fully stack your runes and miss your ability, or die, the runes are consumed. ABILITY 1: AT LAST I'M FREE! Fenrir leaps forward, dealing damage to all enemies when he lands. If the leap hits a god, the Cooldown is reduced by 30%. Unchained does ok damage. Good if you can get the stun and follow up with combos (see next chapter). Max this skill second. Brutalize has more priority. 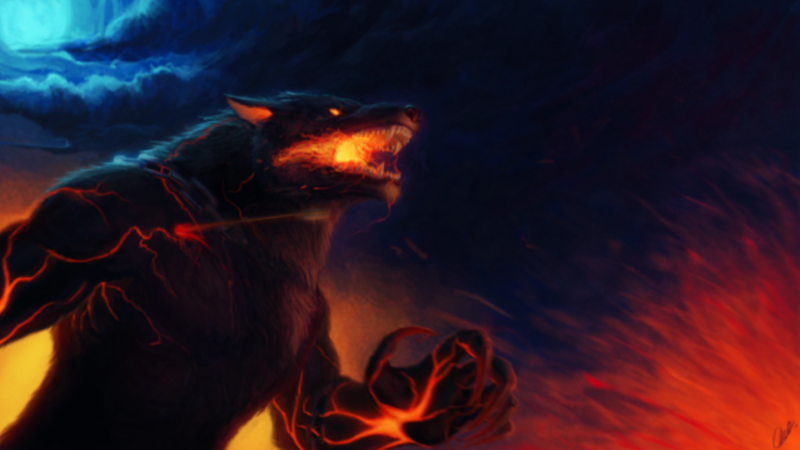 Fenrir rears back and howls, inspiring himself with a Physical Power and Lifesteal Buff. This is Fenrir's steroid (Perhaps THE STRONGEST steroid in the entire game). This is a great way to boost your ability damage for kill secure. If you're trying to box an enemy late game, your howl's power/lifesteal boost will give you the edge you need to win. Unchained and Brutalize have more priority, so max Seething Howl third. You can consider putting your first point in Seething Howl at level 12, after maxing Brutalize and Unchained (Thanks Estidien). Fenrir gains increased protections and pounces to his ground target location. If there is an enemy in the radius, he strikes them 4 times. The increased protections WILL be removed if you are CCed, choose to cancel this ability, or miss. While channeling Brutalize, you are immune to knockups. Not stated in the description, but you are also immune to knockbacks and roots (thanks Draisaitl and BranMuffin for testing this). Each strike also deals 50% damage to nearby enemies. Good AoE damage. Can apply item passives, like Brawler's Beat Stick, to grouped up enemies. At full Runes, each hit deals an additional 15% of your Physical Power. Useful if you need some extra kick to finish an enemy. -Follow up with a basic attack to confirm some damage with Hydra's Lament. -If you see a bad situation coming and need to retreat. Enemies can leap out of it (but can't dash out). The damage falls off late game. Enemies will gain physical defense and HP as they level up (guardians/warriors/some assassins will build protections as well). Max this skill first. This will secure your early game kills. ULTIMATE: TRANSFORM AND ROLL OUT! Upon Ragnarok, Fenrir grows massive in size, becoming immune to CC while moving faster. Fenrir bites enemy gods, dealing Physical damage and carrying them away. Biting a CC immune target deals the damage but ends his Ultimate. At full Runes, his Protections double. This is useful when using Blink Rune. This is also one of your escape tools. You get CC immunity and +50% movement speed. If you do not have Purification Beads ready and an Ares pops his ultimate on you, consider using your ultimate's immunity to retreat or launch a counter offensive. Ares will almost always have a team mate, such as a nuking mage, follow up with his ult. If it's obvious the Ares will ult, you dive the nuking mage and carry him away from the fight to save your allies. Alternatively, Ragnarok is fantastic when carrying away an assailant before he finishes off your teammate. You can drag enemies into your fountain with your ultimate. This is a useful tactic to quickly bring down a guardian or warrior. Just be wary of your team mates. They will, almost always, attempt to ks this from you. 1) Press tab to see which enemy doesn't have Purification Beads. Single out that enemy. What if all enemy team members have Purification Beads? Hopefully some of your team mates have CC. This should force some enemies to burn up their beads. That's when you swoop in. Alternatively, you can use your ultimate to force them to burn their beads, if you know your team will follow up. 2) Build full Unbound Runes (optional). 3) Let your team mates know ultimate is ready (VVVR), and make sure they are all ready on the battlefield. 4) Use Unchained to stun that enemy (or teleport with Blink Rune). Follow up with Ragnarok to bring the enemy back to your team mates for a confirmed kill. Aegis Amulet- Can not bite a target while it's active. However, you can use it immediately AFTER biting a target. Max this skill last. You only get +75 damage per level. Seems like a lot, but the cooldown is 90s with no CDR. Chapter Info: Combo tips. Get creative! After using your abilities, you can immediately follow up with a basic attack. This one is special and has lower delay than regular basic attacks. After using an ability, there is a short time window you have to wait before you can use another ability. Filling that time window with a basic attack is a technique called "Auto Attack Cancelling". In the combos, a lot of the basic attacks I list are auto attack cancelled. Build full Unbound Runes (Optional if you want to initiate with Unchained). Relic choices are completely situational. Use whichever you feel most comfortable with. For game modes like Arena, I usually get Purification Beads first followed by Blink Rune. Removes Crowd Control Effects and makes you immune to new ones for 2s. -Upgrade: Cooldown decreased to 130s. -He has effectively shut down half of Fenrir's abilities from a safe distance. -Without counter building, appropriate relics, or Ragnarok, you're probably going to end up dead if Poseidon's team follows up. Against an enemy that can use their CC to stop you from securing a kill, you can use this relic and Brutalize immediately afterwards. Magi's Cloak can also do wonders here. Allows you to teleport up to 55 units away instantly. You have to be Out of Combat for 3s to use this. -Upgrade: After using this item you gain a 10% damage reduction buff for 2s. Teleport in. Unleash Ragnarok. Bring enemy back to your team to get mauled to death. Profit. Remember that Ragnarok gives bonus protections if you build full Unbound Runes. For game modes with active towers/phoenixes (Joust,Clash,Siege,Conquest, and especially Assault), you can use this combo to teleport into a structure and yank a camping enemy out. I like getting this relic first in Assault. Usually, enemies will buy Meditation Cloak as their first relic. That means you'll be free to teleport in and bring back enemies to your team. Makes you invulnerable to damage and healing for 2s, and prevents you from taking any actions. You may still move. Ideal for surviving high, single hit damage abilities ( Release The Kraken!, Searing Pain, etc) or execute ults from Thanatos and Ao Kuang. Use this in combination with Purification Beads, to prevent enemies from locking you down with CC. Usable while Ragnarok is active. Reflects 50% of all damage you take, before mitigations, for the next 5s back to its owner as Magical Damage. -Upgrades: While this item is active enemies can only lifesteal from you for 50% of their total lifesteal. Use this for fun. Activate when very low health enemy gods use offensive ultimates on you, and watch them kill themselves. This can pair well with Hide of the Nemean Lion against basic attack based gods. Chapter Info: Why certain items are good for ability damage. Optimized for Arena, Clash, and Siege. Fenrir is 100% an early game god. These items will help you capitalize on his high early game damage and kill secure potential. In Arena, I would recommend clearing the camps with your team (be sure to get the damage buff) and returning to base to get Warrior Tabi. This will maximize your early kill secure potential with Brutalize. If you get this as your 2nd item around level 8, your Brutalize will be at its deadliest. Guardians have just started building their defenses while hunters and mages haven't quite built up their damage. Since you haven't built any defenses at this point either, you're just as squishy (be careful). If your team is easily being pressured, Consider skipping this and going straight into defense. Stacks stay until you land a successful, OFFENSIVE ability (if you miss, the stacks won't disappear). It's difficult to stack in Arena since there is only one minion wave, and a dedicated mage can easily clear it. Communicate with your team. During the late game, buy a elixer of power. If you have left over money, get a Potion of Physical Might too. Get the red damage buff. Use Seething Howl, and Brutalize with a fully stacked Heartseeker. Passive: Enemies hit by your abilities have 40% reduced healing and regen for 8 seconds. This reduces enemy healing from abilities, lifesteal, Meditation Cloak, Bracer of Undoing, etc. For team fights, consider targeting the squishiest enemy to prevent him from being healed back up again. +20% Attack Speed helps you build your Unbound Runes faster. Passive: Enemies hit by your damaging Abilities take an additional 20 Physical Damage + 15% of your Physical Power over 2s. Good addition to Heartseeker's damage. PASSIVE - For 8s after using an ability, your next basic attack will deal an additional 50% damage. PASSIVE - This item grants 2.5 MP5 per 10% of your missing Mana. Great damage from Auto Attack Cancelling. For your reference, click on DAMAGE COMPARISON BETWEEN BLOODFORGE, CRUSHER, AND HYDRA'S LAMENT. Passive: Your Physical Damage ignores 15% of the target's Physical Protection. If the target has over 65 Physical Protections, this effect scales up to ignore a larger percentage of their protection. This caps at 40% Physical Penetration at 200 or more Physical Protection. During late game, tanky gods have their defenses online. So this makes a good 5th/6th item. To counter flat penetration, your enemy just needs to build a SINGLE defensive item. Keep in mind that Sovereignty and Gauntlet of Thebes can be a common item on enemy tanks/supports. 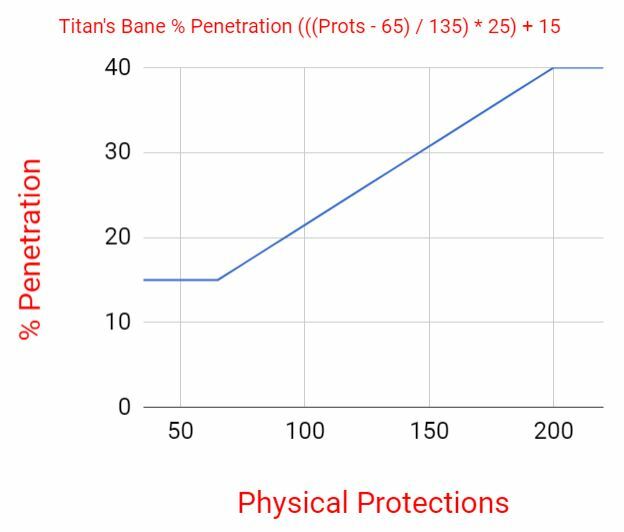 Pick up Titan's Bane if your primary targets are building protections. Otherwise, avoid this item because flat pen will serve you better. This item has reduced efficiency if paired with Void Shield, Stone Cutting Sword, or The Executioner, so be sure to check what your allies are building. Passive: If you drop below 35% Health, you gain an additional 30% Physical Lifesteal for 5 seconds. Can only occur once every 15 seconds. PASSIVE - Killing an enemy god forges a shield from their blood with equal to 200 + 10 per player level for 20s. While the blood shield is active you gain +10% movement speed. This is great in any ability damage build because the passive's health shield and movement speed will help you re-engage or retreat. Fenrir's Seething Howl has built in lifesteal. Combining that with this item will give you an edge in a boxing match. You may consider different items if the enemy team has relevant anti healing. Chapter Info: When and why to build certain defensive/hybrid items. Optimized for Arena, Clash, and Siege. For damage builds, if you build a single defensive item (like Mantle of Discord or Magi's Cloak), you can delay it (or skip it all together) if you are not getting focused, are good at positioning, and are good at picking off vulnerable targets. +20% CDR which makes this helpful to build after Jotunn's Wrath. The max CDR will allow for more ability spamming. PASSIVE – When you take Magical Damage from Abilities your cooldowns are reduced by 3s. This effect can only occur once every 30s. You'll be taking quite a bit of magical damage as a bruiser, so this passive fits in VERY nicely with the 10% CDR. Get this item instead of Breastplate of Valor if magical threats are the biggest concern. PASSIVE: When you take damage and are below 30% Health, you gain a Shield with health equal to 150 +10 per Player Level for 20s. Can only occur once every 60s. I like this item due to all the magic defense and health it gives. If you purchased a phys defense item, this is a great follow up to give yourself balanced protections. The passive can save you in a serious pinch. PASSIVE - You gain +3 Magical Protection and +3 Physical Protection for each god kill or assist. At 7 stacks this item Evolves, providing a Health Shield that gains stacks every 2s. Shield only stacks if you have not taken or dealt damage in the last 5s. Each stack provides 10% of 100 Health + 5 Per Level. You can stack comfortably as a 3rd/4th item. Building it super late won't be as useful since enemies will now have their damage online. The low price tag is a plus. You likely won't make the most of the shield regen passive in fast game modes like Arena. Passive: If you take damage below 30% health you unleash a shockwave that stuns all enemies within a range of 20 units for 1s and gain CC immunity for 1s. This effect cannot trigger more than once every 90s. This is a flexible item. If you're not being pressured too hard, you can purchase it later. The high price tag is a downside. You can build into Cloak of Concentration for a quick and dirty +7% CDR and continue with the rest of your build. Come back and finish into mantle later. Passive: You gain an additional 15% damage mitigation for 3s whenever you are hit with a hard crowd control ability. This can only occur once every 15 seconds. The +40 dual protections aren't that great late game, so you may want to have other defensive items in your build. I like purchasing hybrid items in the middle of my builds because enemies haven't quite built up damage/penetration, so the protections feel more robust. The high power or pen they provide also keeps your mid game strong. Passive: While over 50% Health, you gain +35 Physical Power. When below 50% Health, you gain +35 Magical and Physical Protection. +70 power and +15 physical protections. +35 physical power, +50 physical protections and +35 magical protections. By the time you buy your third item, your abilities are still very dangerous and relevant. Shifter's Shield offers you that perfect balance of power and defense to keep your early-mid game strong (you should still choose your fights carefully). This item's protections (especially the magical protections) fall off late game. AURA: Reduces the Physical Protection of enemy gods within 55 units by 20. This aura helps you AND the physical gods on your team. It's more effective if built early (3rd/4th item slots) because enemies have less physical defense at lower levels. It's a suitable replacement for Titan's Bane in a bruiser build, if you're targeting squishies. Titan's Bane effectiveness will be slightly reduced if you decide to build it with Void Shield. PASSIVE - Whenever you take Magical Damage from an enemy ability you unleash a shockwave that Silences all enemies within a range of 30 units for 1s. This effect cannot trigger more than once every 30s. This is a great hybrid item in any bruiser build. Dive into the grouped up enemy line. Some idiot mage/guardian attacks you with an ability. Whole enemy team is silenced for 1s. +10% Movement Better chase/retreat potential, especially if paired with other movement speed items. PASSIVE – For each Enemy God within 55 units of you, you gain a stacking buff that provides 7 Magical Protection and 7 Physical Protection. Stacks up to 5 times. I often compare this item to Shifter's Shield. They are both great hybrid items since they offer fair power and some protections. Shifter's Shield provides more situational power or defense. Masamune provides more utility (movement speed). Pick what works best for you. Masamune's defense buff is very easy to stack in Arena. Not as easy in Clash, but still very doable. Consider a different item in modes like Siege where you won't get Masamune's full benefit. I like purchasing Masamune as a 3rd item due to the utility. The +50 physical power also keeps my mid game strong. If you think other items (like Void Shield or Ancile) should have more priority in your build, then you can delay building Masamune. The protections fall off hard late game, but the utility is still nice. For basic attack builds, I consider pairing this with Stone Cutting Sword for more utility (helps me dodge and get in/out of fights). Although providing lots of utility, stacking movement speed will cause slight diminishing returns. Read Chapter 1.6 of The Word of Thoth. It's your decision if you want multiple movement items in your build. Basic attacks on an Ability based god!? Passive: Killing or getting an assist on an enemy god gives you 1 stack. Each stack provides 2% Critical Strike Chance. Stacks are permanent and stack up to 5 times. If I build crits, I like to commit. 4th slot is my preference, but definitely don't build this any later than 5th. When fully stacked, and paired with another crit item, I have 60% crit chance (+ Wind Demon) or 65% (+ Deathbringer). This allows me to get crits very often, thus giving me frequent activation of Wind Demon's or Deathbringer's passive. You need penetration for your crits to hurt. Just The Executioner by itself may not be enough, so I also like to pick up Stone Cutting Sword. Crits are countered with Hide of the Nemean Lion, Spectral Armor, or Midgardian Mail. PASSIVE: Crits increase your Attack Speed and Movement Speed by 20% for 5s. Bonus movement speed and EVEN more attack speed for FIVE seconds is really helpful for boxing. One activation of this passive is all you may need to turn a fight around. PASSIVE - On Basic Attack hits, deal Physical Damage equal to 3% of the target's maximum Health. If the target has over 2000 Health, your basic attack bonus damage scales up, capping at 5% max Health on 2750 HP targets. This only affects gods. This item, by itself, is a DPS monster and a great alternative to crits. Remember that Qin's Sais loves attack speed. It pairs well with items like The Executioner and The Crusher. The support who builds Shogun's Kusari for you will be your best friend. Qin's builds are countered with Midgardian Mail and Witchblade. +10% Movement Speed Better chase/retreat potential. PASSIVE – Melee basic attacks decrease an enemy's Physical Protection by 10, and increase your Physical Protection by 10 for 3s (max 3 Stacks). The passive of this activates when used on minions. Use that if you need a quick +30 physical defense buff before diving in with Brutalize or other abilities. The penetration stacks nicely with The Executioner. Level 20 He Bo with 61 physical defense. 3 hits from The Executioner (by itself) will reduce his defense to 39. If Stone Cutting Sword is built as well, his defense will be reduced to 9. +25% Attack Speed this is the reason this item is preferred over Titan's Bane in basic attack builds. PASSIVE: Basic attacks against an enemy reduce the target's Physical Protection by 12% for 3s (max 3 stacks). The penetration from this stacks nicely with Stone Cutting Sword. This passive will help you re-engage or retreat. Fenrir's Seething Howl has built in lifesteal. Combining that ability with this item will give you an edge in a boxing match. Consider different items if the enemy team has relevant anti healing. Chapter Info: Quick recap of everything we talked about. Optimized for Arena, Clash, and Siege. Summary: Most of my listed Builds share similar Early and Mid Gameplay. You will usually purchase Warrior Tabi and Jotunn's Wrath as your first two items to capitalize on this advantage. However, you haven't built any protections, so you're quite vulnerable. Follow up with your allies' initiatives and secure any potential kills with your Seething Howl + Brutalize combo. This gives you time to choose your playstyle for the match (ability damage, bruiser, basic attack, etc). If your front liners are struggling and you're getting focused, think about going into the bruiser route. Consider skipping Jotunn's Wrath and going straight into Breastplate of Valor or Genji's Guard. In this scenario, your final build will probably be tankier than usual. Brutalize is still a decent threat to the enemy, especially if you're going to build into something like Masamune, Void Shield, Ancile, etc. as your third item. Continue following up on your allies' initiatives to secure kills. You should have some CDR by now, so use Ragnarok as much as possible to help setup kills, peel for teammates, chase down kills, and escape from danger. Summary: This is how Fenrir was meant to be played. The builds will typically contain Warrior Tabi, Jotunn's Wrath, some defensive/hybrid items, and a space or two for counter building/situational items. "As a bruiser, the key is to spam your ult to burn enemy beads, give peel, and bring back enemies to your team for confirmed kills" -Draisaitl. Aim to build 30-40% CDR for constant action game modes like Arena. Cooldown time on Fenrir's abilities. Depending on how tanky you are, and your team's composition/awareness, you'll want to initiate fights a bit more as a bruiser than with other builds. Bruiser builds aren't as damaging as basic attack builds or ability damage builds. However, a lot of them do have a fair amount of power and penetration in them. If a situation is forced on you, don't be afraid to pop Seething Howl and start boxing. These builds also have good defense, so you won't be going down easily. Summary: Purchase one defensive or hybrid item (optional). Buy a lot of penetration items to keep Fenrir's ability damage relevant. If you no longer wish to commit to damage, simply trade out an offensive item for a counter build/defensive item. Depending on what defensive item you pick (if any), you'll want to choose your engagements a bit carefully. Although you aren't building crits or Qin's Sais, you have more than enough power and penetration to make your basic attacks hurt. If your abilities are down and you are forced into a 1v1, you are still a potent boxer. If you have a good team, go crazy with these builds. An example start is Warrior Tabi into Jotunn's Wrath. You will sell Jotunn's Wrath for your final item late game. Another example start is Warrior Tabi into Stone Cutting Sword. Jotunn's Wrath gave you +10 penetration for abilities. For Stone Cutting Sword, you have to basic attack an enemy to reduce their protections (this makes your early ability damage a bit clunkier). However, this can be worked around by performing a very aggressive combo with a lot of Auto Attack Cancelling (risky). Purchase one defensive item and/or stack movement speed items ( Masamune and Stone Cutting Sword as an example) somewhere in the middle of your build because you'll be up close and may appreciate the added security/utility. To see Test Results, click on DRAISAITL'S QIN'S BUILD VS. A CRIT BUILD. Don't give much room for flexibility/counter building. Can sometimes put you at a disadvantage since you are a melee god. You can't shoot arrows from a safe distance. Are very expensive and have a terrible power curve. They come online extremely late game because you need to buy multiple items (Example: If you decide to sell Jotunn's Wrath for a different item late game). Ask yourself: How much game time will remain by the time you finish building? Will you be able to buy that Elixir of Power? If you don't get Jotunn's Wrath and get Stone Cutting Sword as your second item, then you lose some early aggression/pressure. Most importantly, Fenrir's kit isn't designed to stick to an enemy while boxing them to death. He has a powerful steroid in Seething Howl, but he lacks the ability to easily lock down his target. Bakasura with his Regurgitate. This HEAVILY slows and cripples enemies, increases his attack range, and makes him CC immune so the enemy can't stop his show. The minions he regurgitates also get in your way and make it harder to box him. The true damage from his Butcher Blades makes him an absolute DPS monster. Kali with her Incense. Fenrir has a 1s stun in Unchained, but he has to build 5 runes first, and it is harder to aim. Kali will likely build Hastened Katana, so once she stuns you, she'll attack you and start sticking to you. Her naturally high attack speed makes her very deadly with Qin's Sais. Her Destruction makes her INVINCIBLE and allows her to dive grouped up enemies to secure kills. Artemis's Vengeful Assault is an attack + movement speed steroid to chase you down. Transgressor's Fate is a cripple and root to lock you down. Calydonian Boar is a stun which can heavily lock you and your team down (thus removing any resistance to her target), while giving her CC immunity. Nonetheless, it's still very fun to outbox hunters and have them rage at you. In the middle of the game, if you no longer want to commit to basic attacks, you should ideally switch to ability based before you buy basic attack specific items. Ragnarok - Escape / CC immunity / Carry an enemy and place them against a wall to prevent them from escaping. Try to get into a situation where you can 1v1 an isolated enemy. Purification Beads out of any CC they throw your way and finish them. You'll be able to outbox some hunters, but be very careful when fighting gods like Kali, Bakasura, Freya, etc. They will have no problem showing you why they are called Hyper Carries. Recall Hide of the Nemean Lion reflects basic attack damage BEFORE mitigations, so it's usually beneficial to build more protections. The exception to this rule is building Spectral Armor. It's not bad to build these together, you just get SOME diminishing returns. 35% CDR (This is no longer valid since Mantle of Discord no longer gives +15% CDR). F*** you Bran. I'm keeping this in here. Test results are outdated, but still give a decent idea about penetration and power. The testing was done against a level 20 Artemis bot. A Potion of Physical Might was used along with an Elixir of Defense. Seething Howl at full Unbound Runes along with a fully stacked Heartseeker were used before each Brutalize combo. Passive: Successfully hitting an enemy god with a basic attack will subtract 1s from all your abilities currently on cooldown. This effect can only occur once every 5s. PASSIVE - For 8s after using an ability, your next basic attack will deal an additional 30% damage. +105 physical power with full unbound runes. Increases Physical Power by 30 for 5 minutes or until you are killed. Also, your abilities deal bonus damage of 15% of your Physical Power to gods. PASSIVE - For 8s after using an ability, your next basic attack will deal an additional 40% damage. Compare the results from patch 4.15 and 4.23 and see for yourself what changes 3% pen nerf on Titan's Bane, 10% damage buff on Hydra's Lament, and 80 physical power instead of 105 on Seething Howl can do. These test results DO NOT credit/discredit Hydra's Lament, The Crusher, or Bloodforge. I'm just pointing out the damage comparison between the items. Test Results are from patch 4.23. Items will get buffed/nerfed in the future, and testing was done under very controlled circumstances. Take the results with a grain of salt. To have adequate control over this test, the majority of items for both builds are similar. This essentially becomes a comparison of Rage and Wind Demon vs. Qin's Sais and Asi. I'll be playing the crit based Fenrir. My friend will be playing with Draisaitl's build. We are just going to stand in front of each other and throw basic attacks until one of us dies. I understand this test may not be as conclusive as you want it to be, but I hope to give you SOME IDEA of how these items can function on a basic attack Fenrir. He will use Seething Howl when he drops to ~50% health (to take advantage of Asi's passive). I will use Seething Howl roughly around the same time. For both builds, let's have The Executioner and Stone Cutting Sword unstacked. For both builds, let's be above 50% HP for Shifter's Shield. The Qin's build has an average DPS of 446 with an average 9 shot kill in 4.1 seconds. The crit build, without Wind Demon passive, has a average DPS of 468 with an average 8 shot kill in 4.1 seconds. With Wind Demon's passive active, this build has an average DPS of 524 with an average 8 shot kill in 3.7 seconds. This is essentially what we observed in the experiment. The crit build was winning at first (when we got some early crits), but the Qin's build turned the fight around when Asi's passive activated. Interpret these results with caution. Any test data involving crits will be random, and SmiteBuilder isn't 100% accurate. In a real scenario, you aren't going to be standing still and attacking each other. Understand that Wind Demon gives you a plus 20% movement speed bonus with its crits. This can be useful in the middle of a fight. If you see your opponent's team mates coming to jump you, you can get the hell out. branmuffin17 for proofreading, allowing me to use his template for the items section, and for helping with Crits vs Qin's Sais tests. Draisaitl for providing very helpful tips on Fenrir. I had tons of discussions with him regarding various gameplay mechanics, items, and builds. Without him, this guide wouldn't be here. You've been a great mentor. You'll be missed buddy. IceColdPappsi for helping with Hide of the Nemean Lion + Spectral Armor tests. Estidien for proofreading and helping with skill order. TheZodiacWolf Farewell Okami, thanks for your contributions to all the Fenrir players. xZeroStrike for help with BB Coding and aesthetic improvements. Bernardozomer for helping with aesthetic improvements. You, the reader, for taking the time to read through this guide. Thank you. I appreciate all forms of feedback. If you didn't like my guide, please tell me why so I can improve it. Even if you disagree with my builds/playstyle, as long as you learned one new thing that helps you, my goal for this guide has been accomplished. On the flip side, you leaving suggestions and comments allows me to learn from you, and I really would appreciate that opportunity. Word of Thoth Smite textbook. It has a TON of useful info regarding the mechanics of the game. Chapters 1, 4.1, and 4.2 are very useful. Excellent bathroom reading material. More info about items. Definitely see chapter 10. Duke Sloth's video to see how different defensive items effect your tankiness. DMBrandon's Fenrir video. Mostly relates to conquest, but still has a bunch of useful info in it. TheZodiacWolf's Fenrir Jungle Guide (Out of date, but still has good info). Smite Builder to simulate DPS of various builds. If you're having trouble using Smite Builder. Removed non functional, troll builds (full movement speed build, etc). Ok. Added it for you. Hope you're happy. 141300 boogiebass Ok. Added it for you. Hope you're happy. 81 secs with trans and with Jotunn's Wrath becomes 63 I guess. It's a reasonable cooldown mid game and a really problem late game. 141072 xmysterionz 81 secs with trans and with [[jotunn's wrath]] becomes 63 I guess. It's a reasonable cooldown mid game and a really problem late game. Yea I know that. I read your guide. But what I'm wondering is: how often do you build trans and jotunn's over full auto attack? In other words, the first build in your guide vs. the other 2 (for conquest ADC tab). 141091 boogiebass Yea I know that. I read your guide. But what I'm wondering is: how often do you build trans and jotunn's over full auto attack? In other words, the first build in your guide vs. the other 2 (for conquest ADC tab). Ah, it all depends. I've seen cupids with cooldown (the most annoying), I've seen cupids with the second build, focusing in BA and I've seen non sense cupids with qin's and crits so all I can say is that 33% build cdr on him, so in my opinion, is a expressive number, at least to put him as a minor threat. 141105 xmysterionz Ah, it all depends. I've seen cupids with cooldown (the most annoying), I've seen cupids with the second build, focusing in BA and I've seen non sense cupids with qin's and crits so all I can say is that 33% build cdr on him, so in my opinion, is a expressive number, at least to put him as a minor threat. Trans, Warrior , Jotunns, Exe, qins, titans, sell boots for o-bow. Or next patch swap jotunns for asi. 141097 Kriega1 Trans, Warrior , Jotunns, Exe, qins, titans, sell boots for o-bow. Or next patch swap jotunns for asi. The reason for the non conquest was because I'm only listing a build with some options. I don't talk about jungle strategies, conquest match ups, counter building for conquest, etc. I want to make it clear for readers this is not a Jg/conquest guide. 139428 boogiebass The reason for the non conquest was because I'm only listing a build with some options. I don't talk about jungle strategies, conquest match ups, counter building for conquest, etc. I want to make it clear for readers this is not a Jg/conquest guide. Seeing this way, my Rama guide wouldn't be for Conquest too, since I just talk about a general play and not specific a Conquest role such as I do in Love, find your mark! or Size isn't everything! Game modes like Arena play EXTREMELY differently from Conquest. I have a conquest build, BUT I need to make it clear that some guide chapters (items, gameplay, etc) are optimized for modes like Arena. Conquest/Jungling are not talked about in the guide, only in that one build. Need to make it clear for my readers so they don't end up combing through the entire guide if all they want is Conquest - They just need to look at the conquest build and purchase notes. 139460 boogiebass Game modes like Arena play EXTREMELY differently from Conquest. I have a conquest build, BUT I need to make it clear that some guide chapters (items, gameplay, etc) are optimized for modes like Arena. Conquest/Jungling are not talked about in the guide, only in that one build. Need to make it clear for my readers so they don't end up combing through the entire guide if all they want is Conquest - They just need to look at the conquest build and purchase notes. DV-8, your new profile icon. Let's take this to one of the bad guides. I have to be honest: the title of your guide was enough to make me upvote it. 135366 Vini_sds I have to be honest: the title of your guide was enough to make me upvote it. 135372 boogiebass Thank you fellow hunter! May you find your worth in the waking world. Don't tell him that! You'll just give him a big head. 135361 Gulfwulf Don't tell him that! You'll just give him a big head. 133728 Gary169 Looks good to me. Updated for 5.20. Feedback appreciated. 133723 boogiebass Updated for 5.20. Feedback appreciated. This guide is longer than my guides XD. Some comments. Before I say anything else (which will be criticisms because those are designed to help you or provide alternate points of view), I do want to say this is one of the most complex and dedicated guides out there. You've put a ton of time into it, and you have a good, strong base of information and knowledge. In your comment at the top in Build 1, Pen/Damage Options, you say you'd get Bloodforge for lifesteal. I'd say that's the LAST thing you'd get it for. The added lifesteal is nice to go with Seething Howl's passive, but you get it more for the high power (great for scaling on your abilities) and for the passive shield upon getting a kill, to help with your survivability. For your counter-building items, since you list Midgardian Mail, you might also list Witchblade just because, as it's another strong counter item. You might also mention in the comments that you should be mindful of teammates' builds, as you often will have a purer tank (Warrior or Guardian) on your team that might be building some of these as well. In your "usual damage build," you might mention that, depending on need, if you want Magi's Cloak but aren't getting focused / are doing well, you can delay the item until later. Getting it immediately after your first main damage/CDR item will stunt your mid-game damage. Delaying as long as possible as long as you don't truly need it is best. In your Seething Howl writeup, you might take out the comment about "After Patch 4.22" now. That's quite a while ago. This writeup is also a bit awkward. It's more like chatting about a portion of the ability (to go with a situational item in Heartseeker), rather than the more directed comments you have in the other ability sections. Instead, focus more on talking about how and when to use it first, then talk about situational if you want. A Technotoad observation here, but in the Brutalize writeup, 2nd sentence, change "was" to "is." In your relics writeup, you visually present 3 relics, but talk about a lot more in the spoiler. I'd suggest showing all of the ones you talk about. I know you're emphasizing the 3 main ones you like, but you also mention those 3 immediately before the icons themselves. Your writeup section (Additional Info) regarding Effective Health is a bit awkward. Rather than that very specific example which takes a long time to say that getting health in addition to protections will help your survivability to a degree (and in your example is only letting you live from one more shot which isn't the greatest example), you might consider re-writing and just getting the main point across. The Word of Thoth uses eHP to give more specific example to how protections add to your perceived health, rather than your version which is sort of opposite. You have comments in your items at the top for basic attacking, but you might do a quick writeup in the actual basic attack items section, just to give a bit more information about when you'd even consider doing this. (Also, in the Deathbringer writeup, it's "complement," not "compliment.") In fact, I'd suggest moving your writeup on this in your gameplay section on basic attack builds to the basic attack items chapter, and rename that chapter "Basic Attack Builds and Gameplay" or something. Keep it separate from the more standard builds. Your Test Results section, at least with regard to Nemean/Spectral, is not intuitive at all with regard to the point you're trying to get across. It starts with the Fen build, and then you're talking about Ares...and it's talking about damage Fen takes. You also talk about Rage being unstacked, but that doesn't really have anything to do with the damage reflection, as % crit chance or whether or not the damage reflected is from crits or non-crits isn't even discussed. Same section, CD Time...just numbers, and honestly unnecessary. And why would you even list 35% CDR if it no longer applies? Same section, Damage Comparison. Again, seems unimportant. 1, you're listing old stats that no longer fully apply...since your guide is so long, you really want to keep only those sections that are actually applicable. 2, if you're just making a point about more pen allowing you to deal more damage compared to just more power, then I'd suggest linking to my pen/prot reduction section of my items guide if you want to make that point. Not saying this to get more views on my guide, but there's just so much information you list here, and it takes a long time to get to the point. I know you spent a good amount of time on this and doing testing, but again...just feel it's not concise enough. I'm flattered you use my Odin build in your troll build list...but it's not one I'd endorse for Fenrir. I know you and I have had conversations about Fen's use of Blink Rune, so we'll have to agree to disagree, but I feel with the added movespeed in his ult form, along with having an emergency leap in Brutalize, you really don't need Blink at all. Leap in, ult and grab, and bring back. Thing is, Odin needs Blink for precise timing to hopefully trap multiple enemies when they are in a vulnerable/bunched up situation...Fen's only grabbing one god, and so you're dedicating 2 items ( Blink Rune and Relic Dagger to something that is often likely to be canceled with Purification Beads. You have a good point and strategy with regard to pulling people from under their towers in Assault since they're likely to start with Meditation Cloak, but that's maybe the only game mode where I'd even consider getting it. Maybe then only put it in the Assault build section. Other game modes will see Beads being more likely, and I just don't feel the payoff is worth it most of the time. In summary, this continues to be a very solid guide, but since it's so long, you might want to consider cutting unnecessary/outdated information where possible. 129458 Branmuffin17 This guide is longer than my guides XD. Some comments. [list][*]Before I say anything else (which will be criticisms because those are designed to help you or provide alternate points of view), I do want to say this is one of the most complex and dedicated guides out there. You've put a ton of time into it, and you have a good, strong base of information and knowledge. [*]In your comment at the top in Build 1, Pen/Damage Options, you say you'd get [[Bloodforge]] for lifesteal. I'd say that's the LAST thing you'd get it for. The added lifesteal is nice to go with [[Seething Howl]]'s passive, but you get it more for the high power (great for scaling on your abilities) and for the passive shield upon getting a kill, to help with your survivability. [*]For your counter-building items, since you list [[Midgardian Mail]], you might also list [[Witchblade]] just because, as it's another strong counter item. You might also mention in the comments that you should be mindful of teammates' builds, as you often will have a purer tank (Warrior or Guardian) on your team that might be building some of these as well. [*]In your "usual damage build," you might mention that, depending on need, if you want [[Magi's Cloak]] but aren't getting focused / are doing well, you can delay the item until later. Getting it immediately after your first main damage/CDR item will stunt your mid-game damage. Delaying as long as possible as long as you don't truly need it is best. [*]In your [[Seething Howl]] writeup, you might take out the comment about "After Patch 4.22" now. That's quite a while ago. This writeup is also a bit awkward. It's more like chatting about a portion of the ability (to go with a situational item in [[Heartseeker]]), rather than the more directed comments you have in the other ability sections. Instead, focus more on talking about how and when to use it first, then talk about situational if you want. [*]A Technotoad observation here, but in the [[Brutalize]] writeup, 2nd sentence, change "was" to "is." [*]In your relics writeup, you visually present 3 relics, but talk about a lot more in the spoiler. I'd suggest showing all of the ones you talk about. I know you're emphasizing the 3 main ones you like, but you also mention those 3 immediately before the icons themselves. [*]Your writeup section (Additional Info) regarding Effective Health is a bit awkward. Rather than that very specific example which takes a long time to say that getting health in addition to protections will help your survivability to a degree (and in your example is only letting you live from one more shot which isn't the greatest example), you might consider re-writing and just getting the main point across. [url=https://www.scribd.com/doc/166529015/The-Word-of-Thoth-A-Smite-Mechanics-Guide]The Word of Thoth[/url] uses eHP to give more specific example to how protections add to your perceived health, rather than your version which is sort of opposite. [*]You have comments in your items at the top for basic attacking, but you might do a quick writeup in the actual basic attack items section, just to give a bit more information about when you'd even consider doing this. (Also, in the [[Deathbringer]] writeup, it's "complement," not "compliment.") In fact, I'd suggest moving your writeup on this in your gameplay section on basic attack builds to the basic attack items chapter, and rename that chapter "Basic Attack Builds and Gameplay" or something. Keep it separate from the more standard builds. [*]Your Test Results section, at least with regard to Nemean/Spectral, is not intuitive at all with regard to the point you're trying to get across. It starts with the Fen build, and then you're talking about Ares...and it's talking about damage Fen takes. You also talk about [[Rage]] being unstacked, but that doesn't really have anything to do with the damage reflection, as % crit chance or whether or not the damage reflected is from crits or non-crits isn't even discussed. [*]Same section, CD Time...just numbers, and honestly unnecessary. And why would you even list 35% CDR if it no longer applies? [*]Same section, Damage Comparison. Again, seems unimportant. 1, you're listing old stats that no longer fully apply...since your guide is so long, you really want to keep only those sections that are actually applicable. 2, if you're just making a point about more pen allowing you to deal more damage compared to just more power, then I'd suggest linking to my pen/prot reduction section of my items guide if you want to make that point. Not saying this to get more views on my guide, but there's just so much information you list here, and it takes a long time to get to the point. I know you spent a good amount of time on this and doing testing, but again...just feel it's not concise enough. [*]I'm flattered you use my [[Odin]] build in your troll build list...but it's not one I'd endorse for [[Fenrir]]. I know you and I have had conversations about Fen's use of [[Blink Rune]], so we'll have to agree to disagree, but I feel with the added movespeed in his ult form, along with having an emergency leap in [[Brutalize]], you really don't need Blink at all. Leap in, ult and grab, and bring back. Thing is, [[Odin]] needs Blink for precise timing to hopefully trap multiple enemies when they are in a vulnerable/bunched up situation...Fen's only grabbing one god, and so you're dedicating 2 items ([[Blink Rune]] and [[Relic Dagger]] to something that is often likely to be canceled with [[Purification Beads]]. You have a good point and strategy with regard to pulling people from under their towers in Assault since they're likely to start with [[Meditation Cloak]], but that's maybe the only game mode where I'd even consider getting it. Maybe then only put it in the Assault build section. Other game modes will see Beads being more likely, and I just don't feel the payoff is worth it most of the time. [/list] In summary, this continues to be a very solid guide, but since it's so long, you might want to consider cutting unnecessary/outdated information where possible. Bran, thanks for taking the time to critique. I'll step through your points one by one. 1) Thanks! I wouldn't have come this far without you and Draisaitl. 2) Agreed with the Bloodforge. Misworded on my part. Will fix. 3) I honestly don't think Witchblade should be an item on Fenrir unless you're trolling. Midgardian Mail is just too good right now to NOT list as a counter build. I'm gonna have to disagree on the Witchblade. 4) Agreed with prolonging Magi's Cloak if you aren't getting focused/are good at positioning/picking off out of position enemies. I sometimes get Heartseeker 3rd instead of Magi's Cloak depending on how the match is going. The reason I put Magi's Cloak in third was because I used to get Shifter's Shield (sometimes Masamune in that third slot (those are great hybrid items to keep your mid game strong). So out of habit, I just put Magi's Cloak in that slot. 5) Agreed with Seething Howl. Will fix that. Thought I removed that note, but it looks like I missed it in my clean up. 6) LOL. This is why Techno isn't in the credits. You're doing his job for him. Time to demote our Gram-Pol Chief. 7) Yes, that's exactly what I was doing. Emphasizing the three main ones I almost always get. I just felt the guide would be cluttered if I listed the rest of the relics. But yea I will consider adding the remaining pictures. After I do it, you tell me if it looks better or worse. 8) Hmm... Yea I just may just remove the section about the Effective Health. It looks a bit wonky. I'm not sure yet. 9) "but you might do a quick writeup in the actual basic attack items section, just to give a bit more information about when you'd even consider doing this." As you've already noticed, it's in the Summary/Gameplay section. However, I will consider this because I keep emphasizing throughout my guide that basic attack Fenrir is fun, but not the best way to play him. 10) Agreed with the test results of Spectral Armor and Hide of the Nemean Lion looking wonky. Will spruce that up. 11) Regarding the CD time... All the test results are at the very bottom of the guide, enshrouded by spoilers. Everything important has already been covered. If people are interested, they'll look at it. If they aren't, they'll get what they need from the top of the guide. The reason I included it was because I felt it may just give someone wondering about the difference between building 30% and 40% CDR. Instead of having to go on another website, or getting on the game to find that info, they can just look at that section. 12) Ehhh. I really don't have anything to say xD. I just thought some people may be curious. I know the test results are outdated, but they still give an idea of how certain shifts in items/skills can affect damage output. Again, it's in a spoiler comment. If people don't wanna read it, they'll skip over it. 13) LOL. Bran, that's exactly what it is. A TROLL Build. Have fun with it! However, I will disagree with you about Blink Rune's viability. Remember, Fenrir is an Assassin. He's not just gonna utilize that Blink Rune to ult. He can use it to chase kills and escape as well. Yes, Fenrir does have a lot of mobility in his kit, but Blink Rune is an added safety. If I blink in to ult, and the target uses Purification Beads (let's say I thought his beads were down, but actually weren't), I have Unchained and Brutalize to get the hell out. If I leap in, and the same situation happens, what then? Also, consider the disruption I'd cause by blinking into the middle of grouped up enemies. A possible scenario: They'll see me blink in and likely burn a few abilities on me, but I'll be CC immune from Ragnarok. This will let my team have an advantage after they follow up. Do keep in mind this is just a few benefits. There are a bunch of pros/cons to picking blink rune over a different relic, and it's a completely different discussion on its own. 129496 boogiebass Bran, thanks for taking the time to critique. I'll step through your points one by one. 1) Thanks! I wouldn't have come this far without you and Draisaitl. 2) Agreed with the [[bloodforge]]. Misworded on my part. Will fix. 3) I honestly don't think [[witchblade]] should be an item on [[fenrir]] unless you're trolling. [[midgardian mail]] is just too good right now to NOT list as a counter build. I'm gonna have to disagree on the [[witchblade]]. 4) Agreed with prolonging [[magi's cloak]] if you aren't getting focused/are good at positioning/picking off out of position enemies. I sometimes get [[heartseeker]] 3rd instead of [[magi's cloak]] depending on how the match is going. The reason I put [[magi's cloak]] in third was because I used to get [[shifter's shield]] (sometimes [[masamune]] in that third slot (those are great hybrid items to keep your mid game strong). So out of habit, I just put [[magi's cloak]] in that slot. 5) Agreed with [[seething howl]]. Will fix that. Thought I removed that note, but it looks like I missed it in my clean up. 6) LOL. This is why Techno isn't in the credits. You're doing his job for him. Time to demote our Gram-Pol Chief. 7) Yes, that's exactly what I was doing. Emphasizing the three main ones I almost always get. I just felt the guide would be cluttered if I listed the rest of the relics. But yea I will consider adding the remaining pictures. After I do it, you tell me if it looks better or worse. 8) Hmm... Yea I just may just remove the section about the Effective Health. It looks a bit wonky. I'm not sure yet. 9) "but you might do a quick writeup in the actual basic attack items section, just to give a bit more information about when you'd even consider doing this." As you've already noticed, it's in the Summary/Gameplay section. However, I will consider this because I keep emphasizing throughout my guide that basic attack Fenrir is fun, but not the best way to play him. 10) Agreed with the test results of [[spectral armor]] and [[hide of the nemean lion]] looking wonky. Will spruce that up. 11) Regarding the CD time... All the test results are at the very bottom of the guide, enshrouded by spoilers. Everything important has already been covered. If people are interested, they'll look at it. If they aren't, they'll get what they need from the top of the guide. The reason I included it was because I felt it may just give someone wondering about the difference between building 30% and 40% CDR. Instead of having to go on another website, or getting on the game to find that info, they can just look at that section. 12) Ehhh. I really don't have anything to say xD. I just thought some people may be curious. I know the test results are outdated, but they still give an idea of how certain shifts in items/skills can affect damage output. Again, it's in a spoiler comment. If people don't wanna read it, they'll skip over it. 13) LOL. Bran, that's exactly what it is. A TROLL Build. Have fun with it! However, I will disagree with you about [[blink rune]]'s viability. Remember, [[fenrir]] is an Assassin. He's not just gonna utilize that [[blink rune]] to ult. He can use it to chase kills and escape as well. Yes, Fenrir does have a lot of mobility in his kit, but [[blink rune]] is an added safety. If I blink in to ult, and the target uses [[purification beads]] (let's say I thought his beads were down, but actually weren't), I have [[unchained]] and [[brutalize]] to get the hell out. If I leap in, and the same situation happens, what then? Also, consider the disruption I'd cause by blinking into the middle of grouped up enemies. A possible scenario: They'll see me blink in and likely burn a few abilities on me, but I'll be CC immune from [[ragnarok]]. This will let my team have an advantage after they follow up. Do keep in mind this is just a few benefits. There are a bunch of pros/cons to picking blink rune over a different relic, and it's a completely different discussion on its own. Just one comment on the Witchblade subject. In the case you're doing your "I'm a tank" impression, why would you rule out ANY solid tanky counter item? Midgardian Mail, I admit, is overall perhaps a better option. However, keep in mind that if you're tanky and the enemy realizes it, they may not be targeting you as much. Unless you're hit by a basic attack, you're getting 0 function out of its passive. Witchblade is better in some aspects. It's an aura, meaning any god close to you is affected. If you want to get WITH Midgardian Mail, the AS slow stacks. 200 health, 10% CDR, and 10% MS are all solid stats. The only partial throwaway is the AS, but works okay if you're trying to get the most out of your inherent lifesteal via Seething Howl. Troll only? I can understand that point of view. But at the same time, I would consider Midgardian to be partially troll in the same vein for Fen. 129532 Branmuffin17 Just one comment on the [[Witchblade]] subject. In the case you're doing your "I'm a tank" impression, why would you rule out ANY solid tanky counter item? [[Midgardian Mail]], I admit, is overall perhaps a better option. However, keep in mind that if you're tanky and the enemy realizes it, they may not be targeting you as much. Unless you're hit by a basic attack, you're getting 0 function out of its passive. [[Witchblade]] is better in some aspects. [list][*]It's an aura, meaning any god close to you is affected. [*]It costs 200 less. [*]If you want to get WITH [[Midgardian Mail]], the AS slow stacks. [*]200 health, 10% CDR, and 10% MS are all solid stats. The only partial throwaway is the AS, but works okay if you're trying to get the most out of your inherent lifesteal via [[Seething Howl]]. [/list] Troll only? I can understand that point of view. But at the same time, I would consider Midgardian to be partially troll in the same vein for Fen. Hey, Thanks Zero! You're a part of this. I hope you're happy to see your BB Coding student graduate! Thanks for all of your help with the coding. 129495 boogiebass Hey, Thanks Zero! You're a part of this. I hope you're happy to see your BB Coding student graduate! Thanks for all of your help with the coding. Go forth, my student, and expand your knowledge in the artistic world of BB-coding! 129519 xZeroStrike Yes, I'm very happy to see you graduate!! I always knew you had it in you. You've made me proud, my student. Forgive me, I'm a little emotional, this is a great day. ;-; Go forth, my student, and expand your knowledge in the artistic world of BB-coding! On aesthetics, everything looks great. You do seem to have a lot of extra spaces between the end of your spoilers and the start of the next section. Makes a lot of empty space in the guide. 1: the section is so big as to create a ton of scrolling if you don't hide it. 2: the info you're putting in spoilers is just extra info, not main stuff. As such, in your skill section, for example, I'd maybe keep some of the stuff in the main section, and put the "bad etiquette" stuff in the spoiler. This is all preference, remember. You do what you want. I'd also maybe keep the "Teamwork w/ your ult" and relics that can be used out of spoilers. Maybe make that a part of the ability combos section. In the basic attack item section, space out BF and Asi. They're smooshed. Instead of an items section, maybe break it down into ability build section with item and gameplay info. And then make a basic attack build section with items and gameplay separate. Don't have time to read any more right now, but I'll get through this later and provide more feedback. 128408 Branmuffin17 Hey boog, Solid update to your guide. You're a super-troll. =) On aesthetics, everything looks great. You do seem to have a lot of extra spaces between the end of your spoilers and the start of the next section. Makes a lot of empty space in the guide. My personal preference with regard to the use of spoilers is for the following: 1: the section is so big as to create a ton of scrolling if you don't hide it. 2: the info you're putting in spoilers is just extra info, not main stuff. As such, in your skill section, for example, I'd maybe keep some of the stuff in the main section, and put the "bad etiquette" stuff in the spoiler. This is all preference, remember. You do what you want. I'd also maybe keep the "Teamwork w/ your ult" and relics that can be used out of spoilers. Maybe make that a part of the ability combos section. FYI Adjust name..."TheZodiakWolf" Haha about my build, I don't remember signing off on that, but I'm okay with it XD In the basic attack item section, space out BF and Asi. They're smooshed. Instead of an items section, maybe break it down into ability build section with item and gameplay info. And then make a basic attack build section with items and gameplay separate. Don't have time to read any more right now, but I'll get through this later and provide more feedback. Hey Bran. Thanks for your feedback! Don't force yourself to critique the guide if you don't have time. Yea i'll look into some of the spoilers. Thanks for pointing this out. Regarding ability/basic attack sections with items/gameplay separate, I honestly can't think of anything new to add to gameplay/items that I haven't already covered in the guide. I figured that most of my readers probably won't even look at a lot of this. They'll just look at the builds, and the info of the builds (question mark thingy). I tried to put relevant summaries you need regarding a build in the question marks, to make it easier for readers. Should I add counter building to the items section? Or was my explanation in the quetionmark sufficient? Counter building is located under build 1. Regarding "Branmuffin's Build" - I learned it from you lol. It's not something I created by myself. Credit needs to be given. 128409 boogiebass Hey Bran. Thanks for your feedback! Don't force yourself to critique the guide if you don't have time. Yea i'll look into some of the spoilers. Thanks for pointing this out. Regarding ability/basic attack sections with items/gameplay separate, I honestly can't think of anything new to add to gameplay/items that I haven't already covered in the guide. Regarding gameplay: I've pretty much covered everything I can in its respective section (How/when to use skills/combos in the skills section; Which situation to build relics for in the relics section; Why to build certain items in item section; Generic build templates and example playstyles in the build summary section; etc) I figured that most of my readers probably won't even look at a lot of this. They'll just look at the builds, and the info of the builds (question mark thingy). I tried to put relevant summaries you need regarding a build in the question marks, to make it easier for readers. Should I add counter building to the items section? Or was my explanation in the quetionmark sufficient? Counter building is located under build 1. Regarding "Branmuffin's Build" - I learned it from you lol. It's not something I created by myself. Credit needs to be given. Regarding sections, I'm talking chapters. Right now, you've got an items chapter (4), Build Summaries and Recap. I'm saying, separate them into Ability Build: Items & Build Summaries, and Basic Attack Build: Items & Build Summaries. Right now, you've got "Items for Basic Attack Builds" at the end of the items chapter, and then Basic Attack Builds after Damage and Bruiser Ability builds in the Builds chapter. Keep the ability section together, and the basic attack info together. Get what I mean? Regarding counter items, you don't really list any in your items sections...if you end up playing him as tank or whatever, get a couple of those in there. You can create a separate counter building items group if you'd like. 128410 Branmuffin17 Regarding sections, I'm talking chapters. Right now, you've got an items chapter (4), Build Summaries and Recap. I'm saying, separate them into Ability Build: Items & Build Summaries, and Basic Attack Build: Items & Build Summaries. Right now, you've got "Items for Basic Attack Builds" at the end of the items chapter, and then Basic Attack Builds after Damage and Bruiser Ability builds in the Builds chapter. Keep the ability section together, and the basic attack info together. Get what I mean? Regarding counter items, you don't really list any in your items sections...if you end up playing him as tank or whatever, get a couple of those in there. You can create a separate counter building items group if you'd like. Hha, no worries man, I appreciate the credit. Nice guide, by the way, I'll be sure to try this build and your information provided next time I decide to pick Fenrir again. 120711 xZeroStrike [quote]7/22/17 Forgot to give credit to xZeroStrike for help with BB Coding. Zero, if you're reading this, thanks for your help, and sorry I forgot to add you in the credits[/quote] Bully!! :c Hha, no worries man, I appreciate the credit. Nice guide, by the way, I'll be sure to try this build and your information provided next time I decide to pick [[Fenrir]] again. I used the build twice. The first time I was Wolf Man Fenrir. Naturally, I lost. Then, I tried again, but this time I was Lord Slashington III Fenrir, and I obviously won. The key to winning with Fenrir is definitely that you need to be Lord Slashington III or you will get destroyed no matter what. Your guide helped a lot though, keep it up. 120805 boogiebass Thank you! I'm glad you enjoyed it!